This project should really be called a renovation or reinterpretation, since it was mostly a redo of 1980s construction. 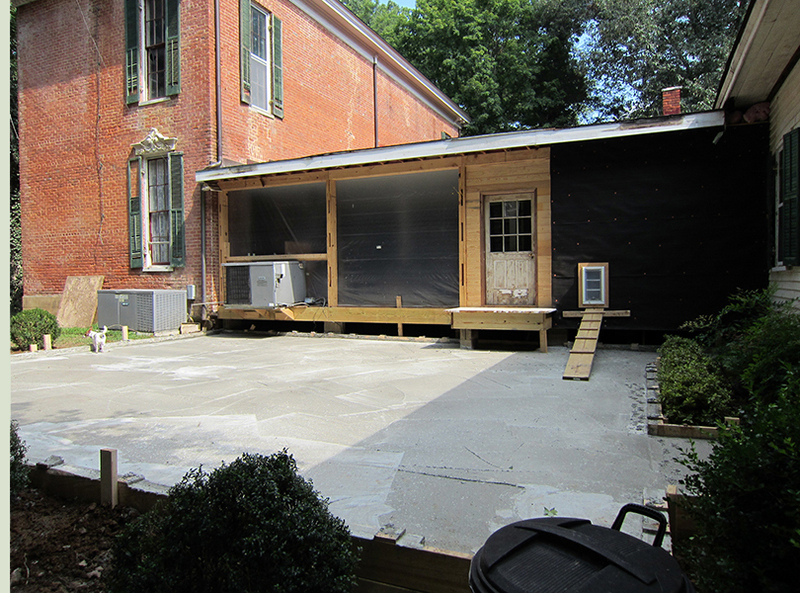 These photos courtesy Ray Rosser and Chelius Carter show the south porch before and after work by previous owners. 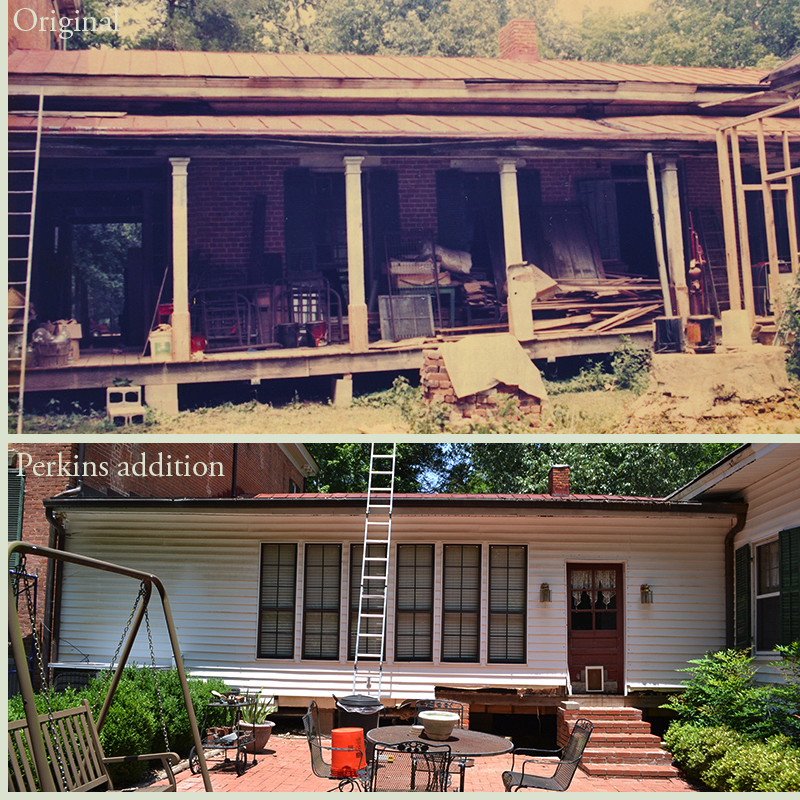 Major design and construction issues required our demolition back to the original porch and a complete redo. Imagine walking across a room and your foot going through the floor. This actually happened in our den. The whole room was a disaster. The foundation was underbuilt, with widely spaced 2x8s propped up by an assortment of wood blocks and cinderblocks sitting on the ground with no footings. Nothing was level. A marble could be dropped anywhere and it would take off rolling. When we walked, the whole room bounced as if on a trampoline until one day it finally snapped in the center. 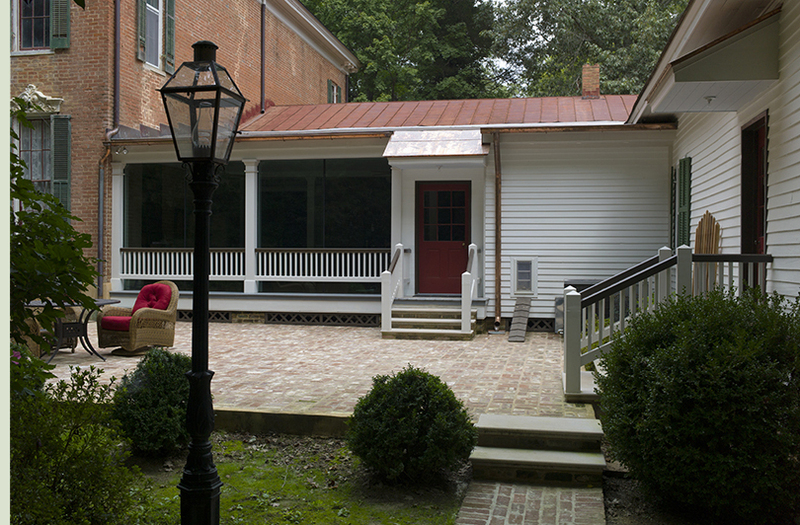 The back wall ran flush with the south edge of the main house over to the cook house, with an array of small, modern aluminum windows. 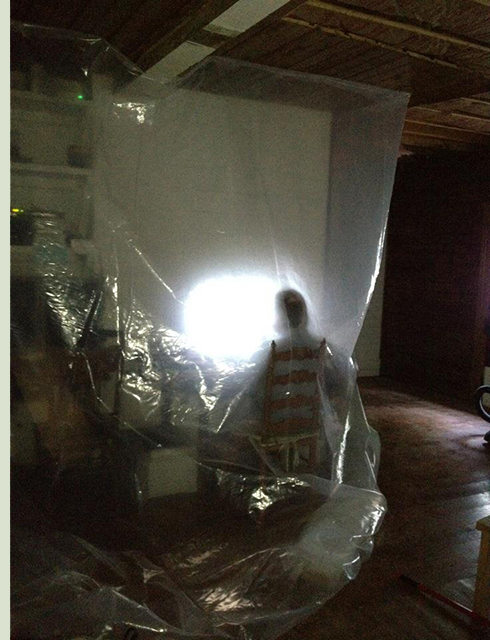 The whole thing was covered with vinyl siding over particle board. To us, it looked like a trailer house parked against the back of the porch. Not that we have anything against trailer houses. But it did not belong there. The door sill was rotted out and had been repaired with particle board. The door itself was stuck and hadn't opened in several years. The brick wall had been covered up on the west end with a modern-profile siding, and all of the interior surfaces were darkly stained. A long porch had been turned into a dark, claustrophobic space. I really wanted to recreate the look and feel of sitting on a porch, with a view of the beautiful woods to the south. The idea was to build an additional set of columns mirroring the original and glass the whole thing in. Everyone is entitled to an opinion. I think it turned out well. Dark interior from late 1980s. We have removed the old foundation, placed multiple concrete and block piers, and are installing treated 12x12s. An old man in a precarious position. Photo by Joey Warner. There is nothing like taking call in such a mess! Photo by Kristin Warner. Man in a bubble. I'm on call again. The dust was flying everywhere, and we needed to seal off my computers as best we could. Photo by Kristin Warner. Wow! I'm amazed these steps didn't cave in. The previous owner built them right over an old cistern which he had loosely filled. This whole area used to fill with rainwater, and now we know why. After consultation, Jim came up with a good solution. 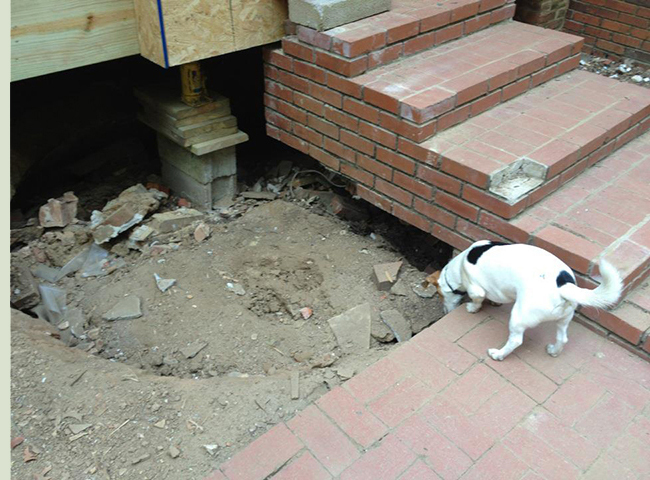 He and the bricklayers pulled out the old patio and steps. Jim then framed out and poured a large and very heavy coffin shaped slab that bridged the old cistern. 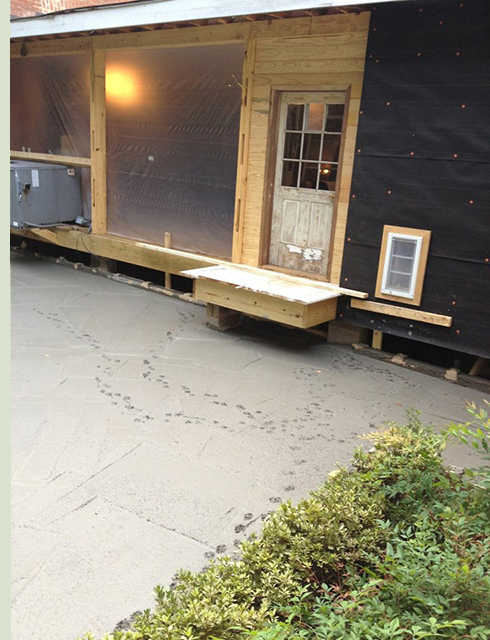 We then poured a slab on top of that to cover the whole patio. Murphy always has to check everything out. Fortunately, it would be covered with bricks. We're deep into the project. It's the hottest part of the summer. The wall has been ripped out and covered with plastic. It's hot as hades in our den. So it is time for some redneck engineering. The AC unit was lifted up and stuck halfway into the room just so we could have some relief! The 1850s door came from Holly Springs, MS by way of Chelius Carter. Since there was no way I would even consider cutting a hole in this door, a dog door has been added to the new wall on the right side. 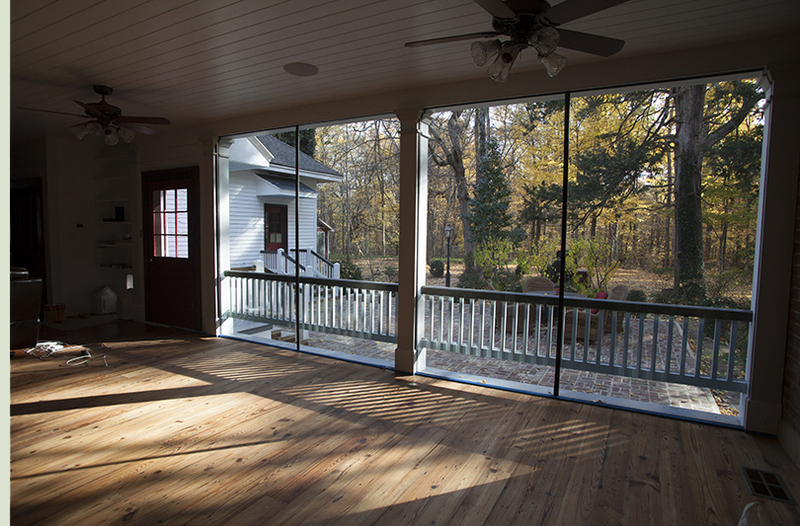 So we've added a new dogtrot. What a mess! This is our den. We live in this room. Our tv is in here. My radiology computers are in here. Our internet cable and DirecTV cable come in here. 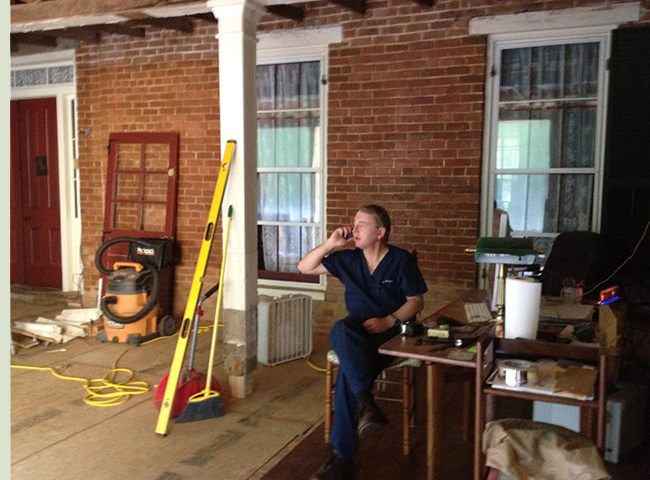 By this point, the old foundation had been pulled out and replaced, a new subfloor was down, original columns were set back in place, the exterior wall was out and covered with plastic, and we were miserable. We had to live in it while working on it. Much-needed bookcases were installed, and the AV equipment was relocated to the same wall as all of my computer stuff. Fans stirred the hot air up and gave a little relief. The windows finally arrived! We can finally retain some of the cooled air. But there would be a problem. Two days after the very large and expensive windows were installed, I got up early to admire the view. To my horror, one of the windows was in thousands of pieces! 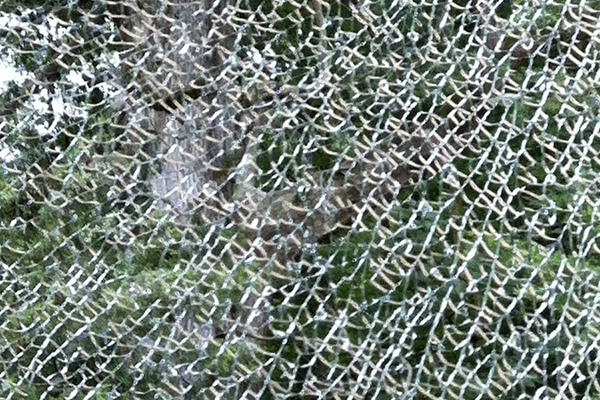 The window man called it a tempering flaw that they see occasionally. The manufacturer covered it completely, and we moved on. But it took another three weeks before the new window came in. The project allowed construction of a pantry/closet. As anyone who has ever lived in an old house knows, there is very little storage space. The new closet needed doors, and I decided to make them. Kristin and I made careful measurements of a double door in the front of the house that was almost exactly the right size. I drew them up in the CAD program, and we built them in the shop. 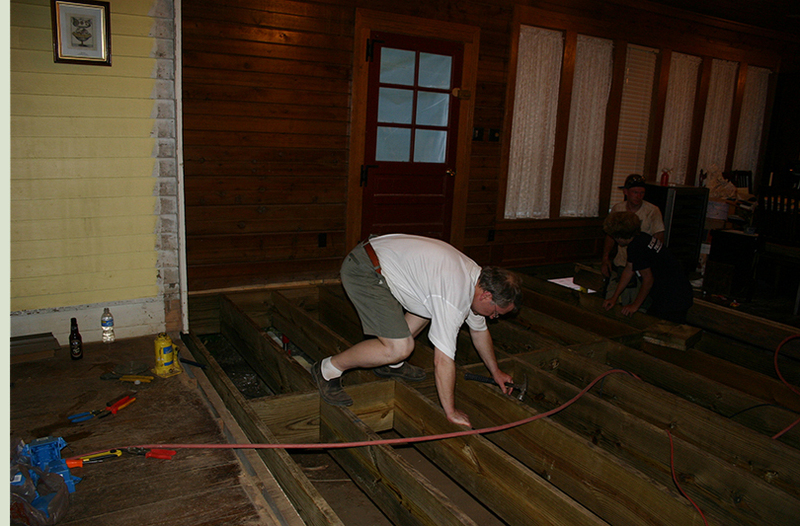 Jim did the vast majority of the work here, and he was careful to match the grain on the panels. The lockset is a very unusual one with an 1842 patent date. Hinges are all period, fixed-pin. 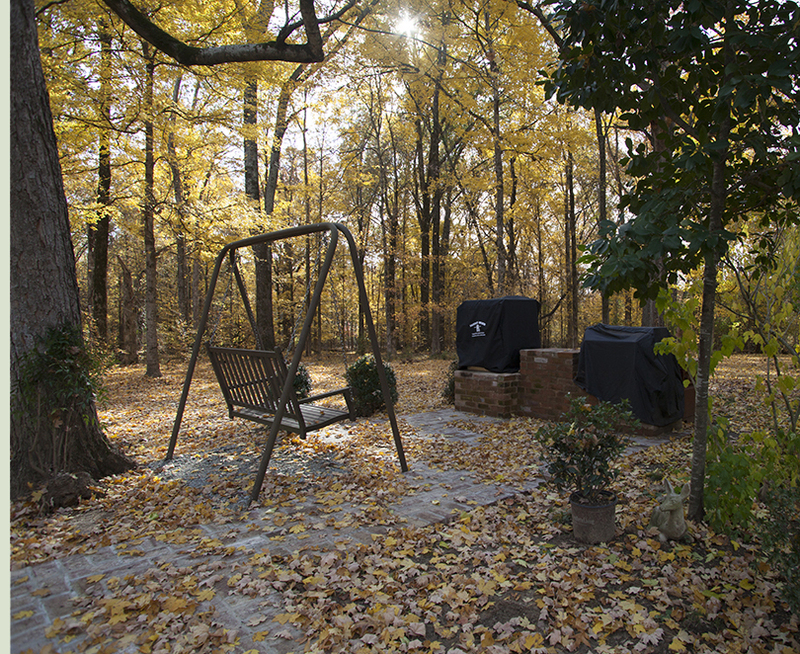 To the left is a portrait of Captain John Wood Mebane, CSA, KIA, buried in our back yard. One of several CAD drawings for this project. 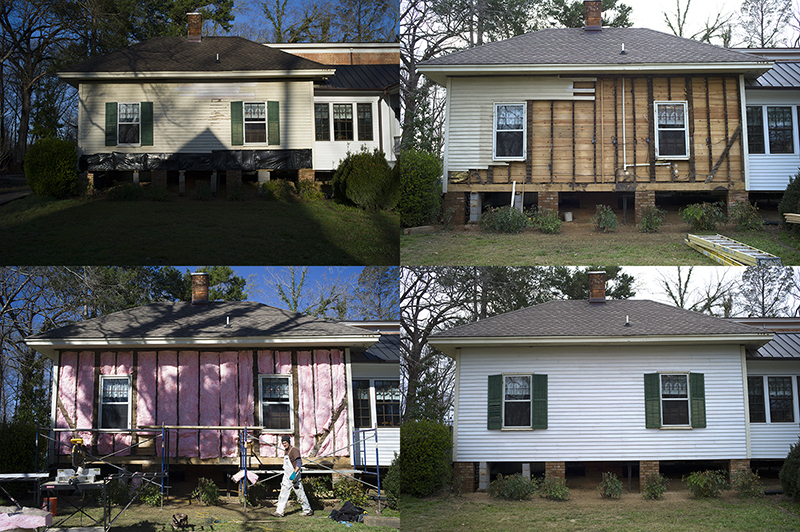 (L) The previous owner had removed an original window and covered the wall with modern beveled siding. 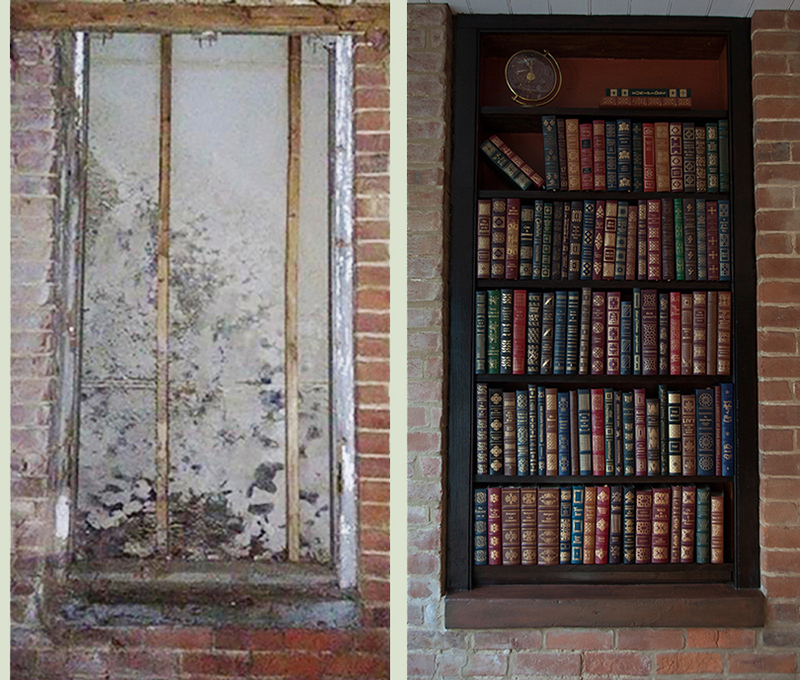 He had cleverly used this space for a built-in bookcase, but it needed an overhaul. 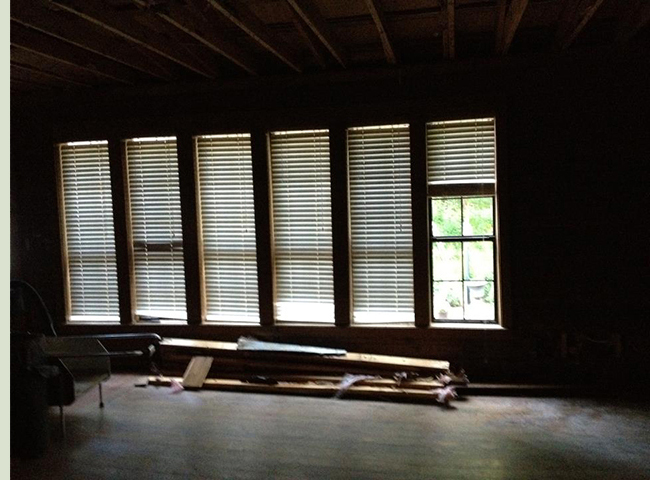 The old room was very dark, even when the blinds were open. What a view! This now feels so much more like a porch. Antique heart pine flooring has been installed. 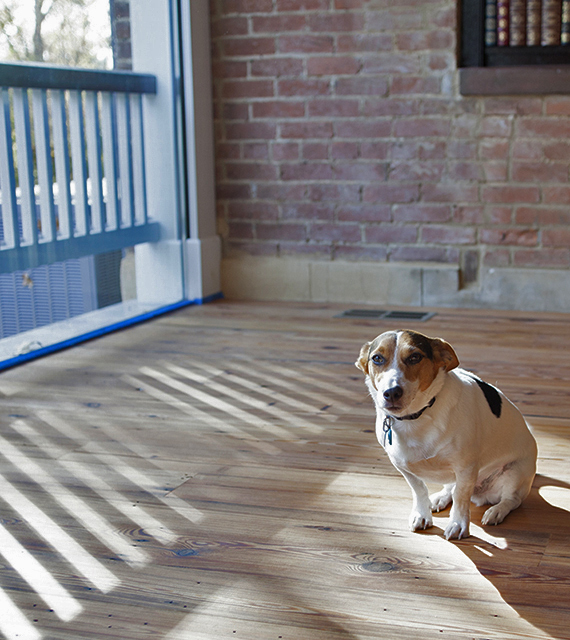 Murphy is soaking up the rays in the new room. The floor is prepped for finishing. 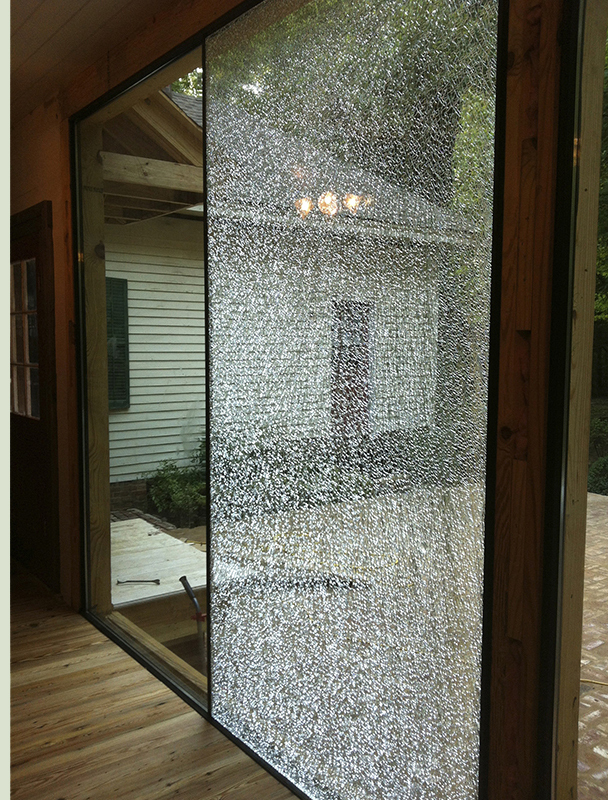 I came up with a design that allows quick removal of the new porch rails for easy window cleaning. The HVAC units were relocated so they're out of sight when looking out the window. We're not getting any younger, and decided to go with hand rails coming down from the kitchen and "den". Chelius Carter drew up the stoop porches and expanded patio. I got the post lamp from Bevolo in New Orleans. While we were at it, I wanted a place to cook outside. Under the covers are my Backwoods smoker and charcoal grill, with a small service top in between. We're well into fall, and the maples are beautiful. Of course, that means a lot of yard work to come. Timing is everything. Our house project had to take a backseat briefly for something that popped up. I always wanted a period bell. Several years ago, I came upon a fantastic bronze bell made by G. W. Coffin at the Buckeye Foundry in Cincinnati between 1837 and 1865. These are the most beautiful bells from the period, with deeply cast details. During the Civil War, many of them were melted down for armament. Ours supposedly survived in a church in Trenton, Tn. I drew up plans for a tower and we put the bell up. But the original yoke was long gone, and the blacksmith-made replacement was far too rickety to trust. These bells are heavy, and the last thing we want is for it to fall on someone. The undersized wrought iron frame started to list, so I set the bell down onto 4x4s until a more secure mount could be found. Just before starting the cookhouse project, I had an opportunity to trade up to a larger, 25" diameter bell from the same maker. Importantly, the dealer has connections to a foundry that can cast yokes of modern ductile iron from original molds. In the middle of the winter, I made a quick trip to East Tennessee, and the deal was made. 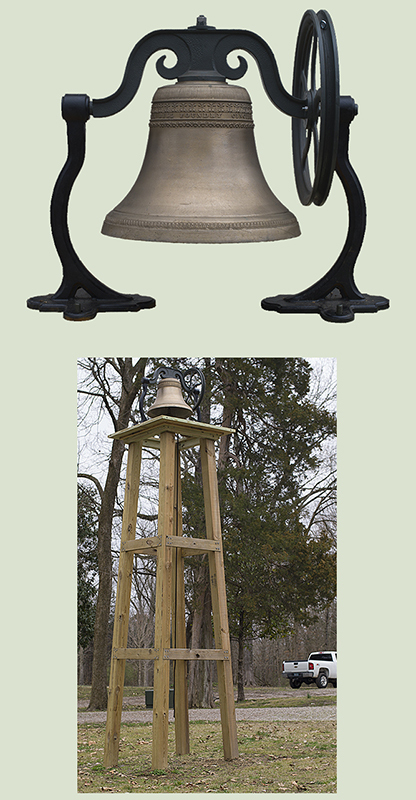 Modifications were made to the tower, and we now have a nice bell. When plumbing was first brought into the cookhouse in the 1980s, large holes were inexplicably drilled through the middle part of the beam at the base of the house and pipes were run through it instead of behind it. Subsequent water leaks compounded the problem, and the beam eventually broke in two. 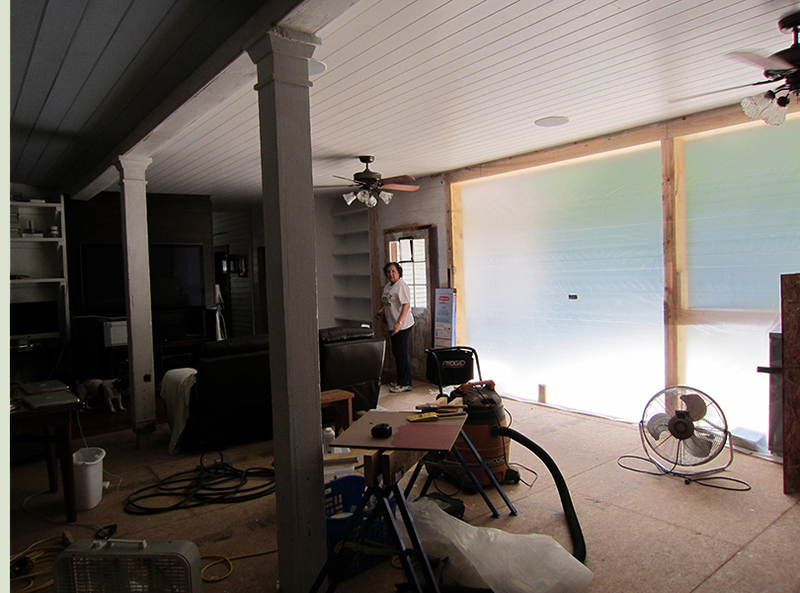 The center of the house sagged several inches and the clapboards snapped all the way up the wall. The solution at the time appears to have been placing a few cinder blocks directly on the ground with no footing, covering the whole thing up with vinyl siding and forgetting about it. We jacked the house up and set a new white oak beam in place. This was quite an undertaking, since the original studs and diagonal braces had been mortised and wood-pegged into the beam. New piers were built and the house was set back down. 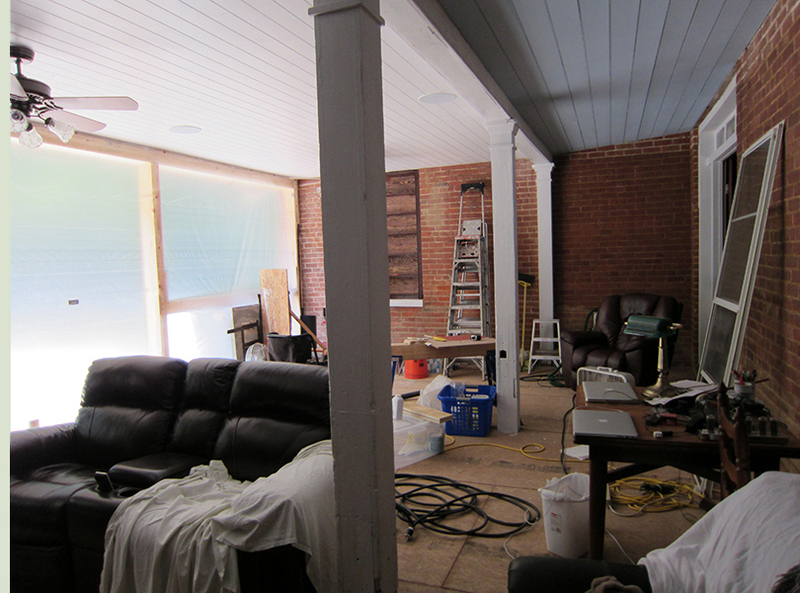 Sadly, we had to replace all the clapboards on this side of the house. But there is consolation in the fact that the original siding is intact on the other three sides. Removing the clapboards did allow us to rework some wiring to the kitchen and install much better insulation on the side of the house that gets the most direct sunlight. Cookhouse after completion of restoration in 2013. Finally, the cookhouse and southeast gallery base were wrapped with lattice made in our shop and new crown molding and shingle strip were installed. 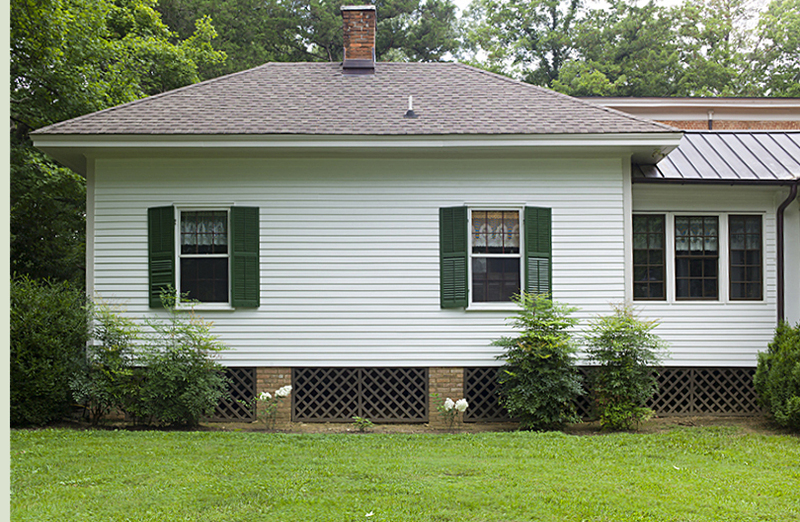 Jeanne Potts and her all-girl crew painted the house, and the transformation is complete.